David Marquet, an experienced naval officer, had an idea to turn his ship around. He shares the story of how, by challenging the navy’s traditional leader-follower approach, he propelled his ship, within one year, from worst to first in the fleet. How? He rejected leader-follower as their model. 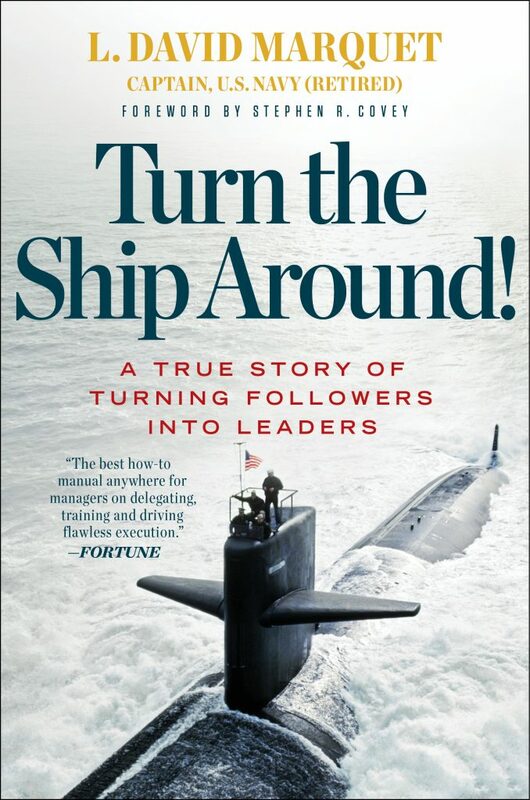 The idea came to him when he gave an impossible order to his crew (of more than 100 sailors aboard the USS Santa Fe, a nuclear-powered submarine) and they blindly followed him because “he told them to.” What if, instead, they were each empowered to challenge and to lead? Turn the Ship Around! is the story of Marquet’s journey with his crew. He shares the phases of struggle from his frustration, questioning, and ultimate rejection of the leader-follower model, to the trials and tribulations adopting the new model, to the ultimate overwhelming success with the leader-leader model. As he says, the steps are evolutionary while the result is revolutionary. His book is a call to action for all those frustrated workers and bosses for whom the leader-follower model just doesn’t cut it! You will find answers in these pages and those answers will lead you to greater success.